It's important to remember that for military families or families who have lost loved ones this time of year can be extraordinarily difficult. In nine years of combat in Iraq and Afghanistan, more than 5,800 families have lost a mother, father, son or daughter to the war. Some 42,000 families are caring for a family member with physical wounds or the less visible damage of traumatic brain injury or combat stress. Among those most severely affected are the children of military families, kids struggling with sorrow, fear, anger, resentment and a sense of betrayal: My Dad promised he'd be OK but he isn't, and the military didn't keep him safe either, so who can I trust?. For these children and their families, a new hero has emerged: a Muppet named Elmo. Elmo and his Muppet parents and friends, together with real humans, figure out how to talk through anguishing situations, how to find the words to use to express grief, fear, anger, and how to harness the healing power of love. Thank you David Woods for reporting on this. 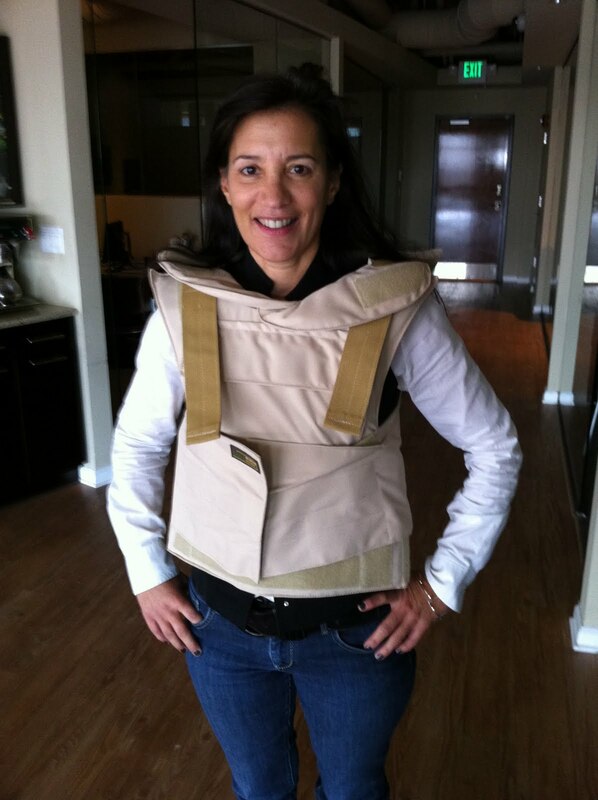 Yippee, I got my vest yesterday. It's quite the thing, actually stylish. I may be the best dressed reporter in Afghanistan. It is REALLY heavy. I knew it would be but it is about 1/4 of my body weight. I can't wait to lug my duffle bag etc. through all the airports I'm going though. I hesitate to check a bag. It will also be interesting to see how TSA reacts to me. When I was in Chicago a few months ago, I lost my personal wallet. I had my business wallet with my business credit cards. I was trying to catch an earlier flight. American Airlines issued my boarding pass with no problem...then I went through the line and sure enough I had to stand aside. They called for the TSA head and she asked me to show her my credit cards. I opened my wallet and she noticed my CostCo card. I had forgotten a CostCo card has a picture! So I got through security with my CostCo card. The update is: my helmet will now arrive no later than Monday and my flak vest has cleared customs. At least I will be prepared if I return in spring with the 25th division. I'll only have to wait for my embed orders. When I told Gabriel that I'd be coming through Kabul I asked him if there was anything he wanted from the US. He told me no, that they already have metric tons or Oreos. This comment reminded me of an excerpt from the book, "Brave Men" by Ernie Pyle. He was speaking with an infantry man who had just received yet another package of SPAM from his wife. For those of you who don't know SPAM was created by Hormel as the miracle meat in a can. The catch phrase was, "If You Want Something Grand Ask For Spam." 100 pounds was shipped to the Allied Forces in WWII. But for me personally, I can't imagine there ever being enough OREOS. As the date gets nearer it's hard to believe that for my vacation time I'm going off to war in Afghanistan. There are still a couple of hurdles that could prevent my going. I haven't gotten my helmet yet, but Juliette at USCav has assured me it will arrive on Thursday. I also haven't gotten my flak vest and I'm very concerned about this! The company I bought it from in Israel have assured me to be patient that the mail takes longer during the holidays...All I want from Santa is a level 4 ballistic flak vest. When I first got this idea and started posting blogs, there was a certain thrill in watching soldiers fight...but now when I watch these videos, I see too clearly what I'm going to experience and it isn't thrilling at all, it's tragic. I'm eager to know what makes these soldiers put on these uniforms and sign up for the job of being a soldier.